Nathan Software has created many simple Java Games. They are all licensed under the Creative Commons Attribution 4.0 license. All the source code for these games is open source please contact the administrator for access to it. Black Jack 21 is a classic card game, in which players try to get as close to 21 points in their hand without exceeding it. This is a simple single player game that can be played alone or versus the computer. 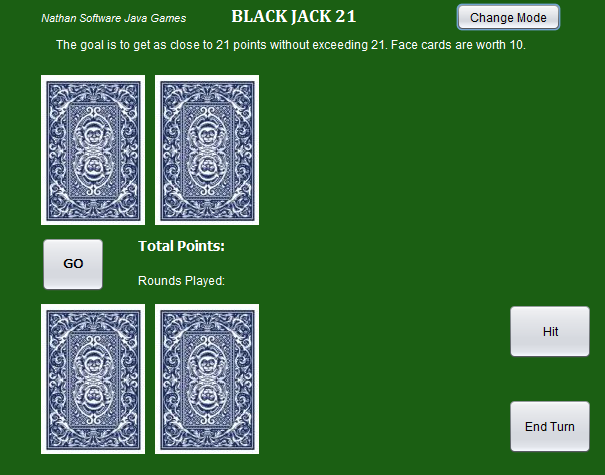 Note: Aces are worth 1 or 11 points in Black Jack 21 and Face Cards are worth 10. At the start of each round press GO. Then if you want more cards you can press “Hit”. When you are finished press “End Turn” and then “Reveal” after the computer has gone. The player with the most points wins.